Once upon a time, Alfa Romeo was a name that stirred the hearts of car enthusiasts around the world. The Alfa Romeo 8C Competizione — now more than a decade old— is still regarded as one of the most beautiful high-performance exotic ever made, with a 450hp 4.7-litre V8 under its beautifully-shaped Italian coupe hood. Now nostalgia can do wonders for a car brand that’s trailing behind with their modern offerings, but there’s only so long the Italian carmaker could go before feeling the strain. Of course, the most logical move to make in today’s climate is to simply make a SUV, and so Alfa Romeo did just that. Named the Stelvio — after Italy’s highest mountain pass and what Top Gear crowned “the greatest driving road in the world”, the five-door compact crossover SUV marks the 108-year-old firm’s first foray into the off-roading segment. It joins the likes of Porsche, Rolls-Royce, and even Lamborghini in the luxury SUV theme. The Super-spec ranks second in the extensive model range — which comprises of the standard Stelvio, then Super, Speciale and Milano trims, before peaking with the Quadrifoglio version. All versions come in a standard five-door SUV body, but what sets the Super apart from the base model is the option for all-wheel-drive as opposed to the rear-wheel drive. 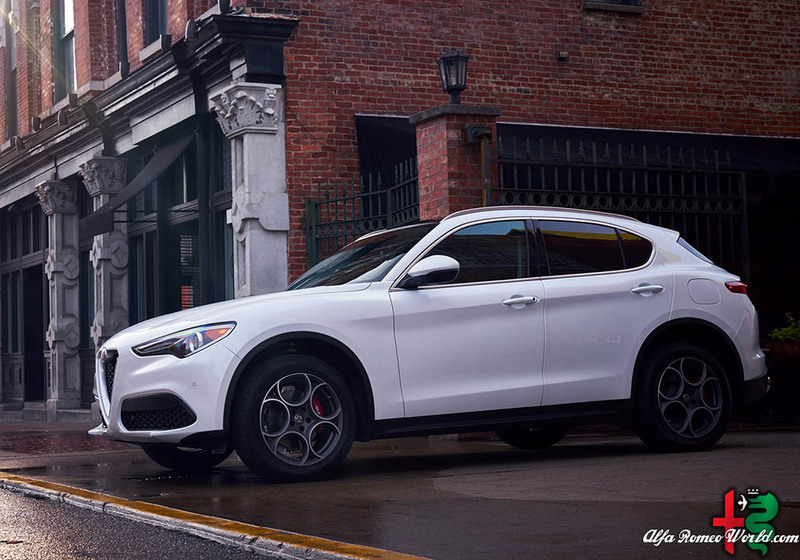 As an Italian thoroughbred, the Stelvio Super scores on appearance. Alfa’s distinctive snout harkens to the Giulia, and the plunging shield grille and slim headlamps fuse effortlessly into the rest of its curvaceous lines. Tucked under the swooping bonnet, the 200hp 2.0-litre turbo engine also produces 330Nm, and is mated to an eight-speed automatic transmission, optimised for both performance and efficiency. Expect a top speed of 215kph and a 0-100kph sprint in 7.2 seconds. Alfa Romeo is also keen to point out that weight distribution is perfectly calibrated here for the ultimate drive on any terrain. Because the Stelvio shares the same Giorgio platform as the Giulia, it is inherently rear-wheel biased. Although the Q4 All-Wheel-Drive system sends power to the rear axle most of the time, it can kick a maximum of 50 percent of torque to the front wheels for more traction. On the roads, this means a particularly sporty and dynamic driving experience. The AlfaLink rear suspension is in charge of keeping the Stelvio’s tires firmly plated on the tarmac and with remarkable stability at turns. Lightweight carbon fibre and aluminium are also used throughout for efficiency and an improved driving experience here. For a brand that’s new to the SUV game, the Stelvio Super is a well thought-out amalgamation of comfort, style, and performance. Its interior reflects the same Italian flair — its dashboard design is borrowed from the Giulia, with options for real metal and wood inlays to jazz things up in your burly ride. The range-topping Quadrifoglio will undoubtedly be the ultimate Alfa Romeo off-roader, but until she arrives in town, the Super is your next best companion.